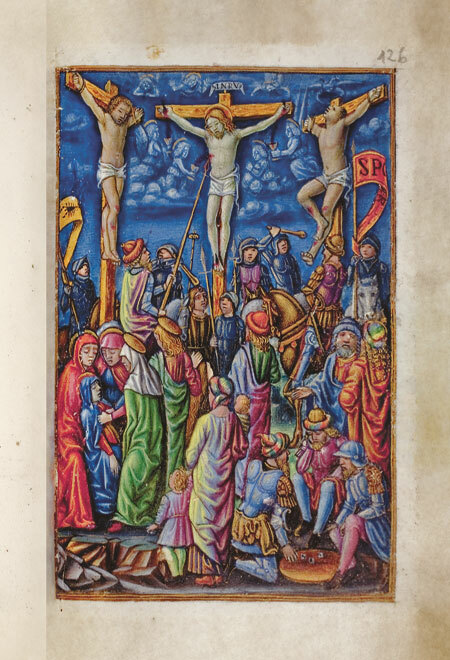 With its extraordinary binding and highly elaborate illumination work, while very small, this precious Book of Hours must be considered an absolute masterpiece. 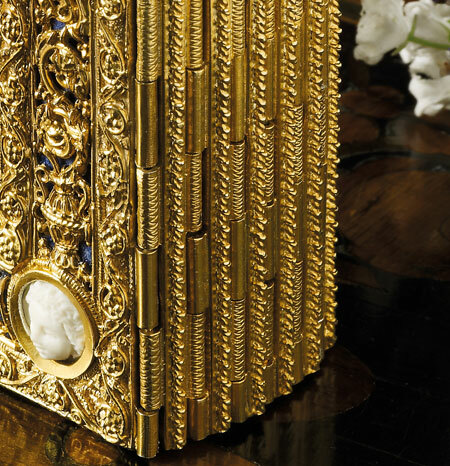 The splendid binding The Torriani Book of Hours is just one of a small handful of manuscripts of this period which still have their original bindings. It is therefore an exceedingly rare item. 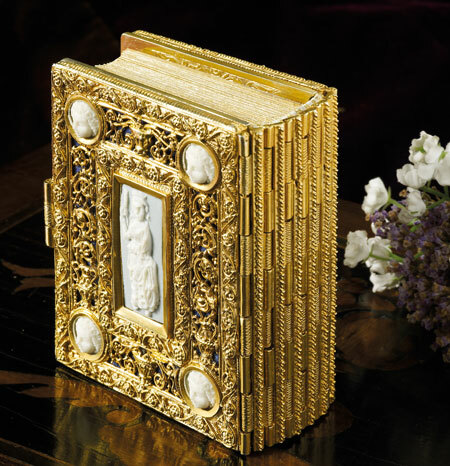 The two binding covers, with their gilded silver filigree work, are adorned with cameos representing Saint Catherine and Saint Lucy. 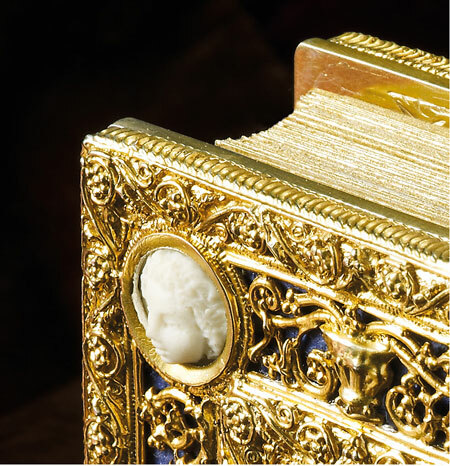 Inside the binding covers, we also find 14 enamel inserts representing the Kiss of Judas, the Way to Calvary and twelve busts of saints. 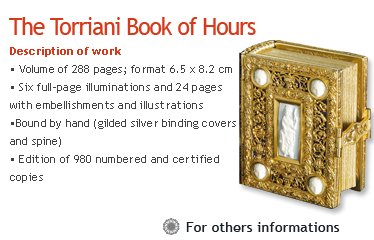 The wealth, luxury and refinement of the times is clearly illustrated by the Torriani Book of Hours, alongside other devotional works of this kind produced by the jewellers’ workshops of Milan under the House of Sforza. 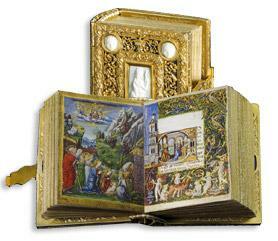 The refinement of the embellishments Thirty illuminations adorn this small devotional codex for private use. Twelve are Calendar illustrations. 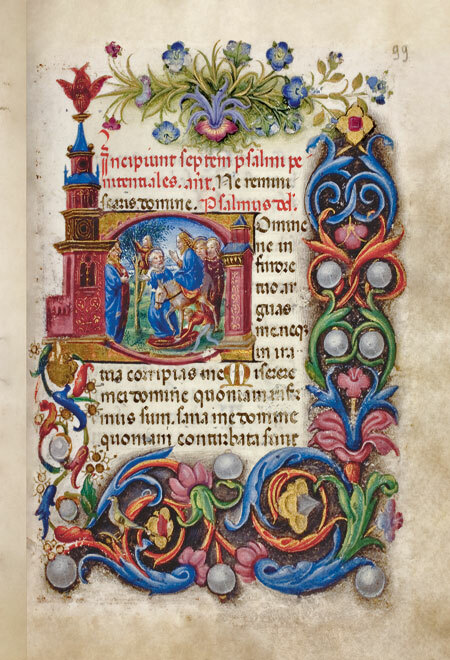 For the eighteen Offices of the Virgin we find six full-page illuminations and twelve pages with illuminated initials featuring architectural and floral motifs, putti, birds and rabbits. 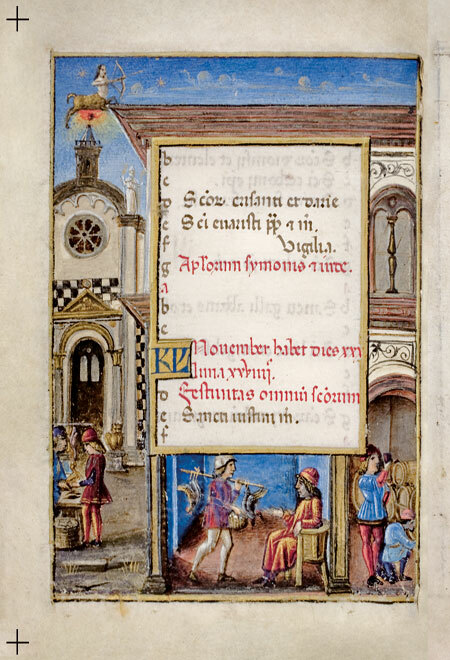 A master’s workshop The illustrations for the Torriani Hours may be ascribed to the Milanese ‘bottega’ (workshop) of the master, Giovanni Ambrogio de Predis. 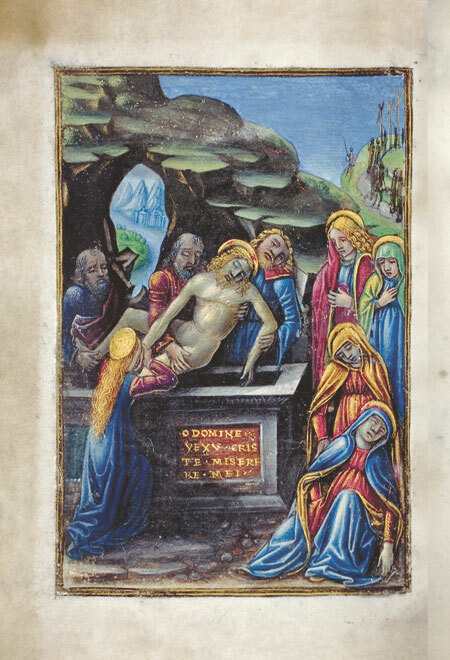 This leading workshop operated in full awareness of the latest developments in the field of painting in Lombardy at the close of the fifteenth century, and, in particular, of the art of Leonardo da Vinci (with whom de Predis worked in 1483, on the Virgin of the Rocks). The embellishments of the borders, with their markedly naturalistic representations of animals, jewels and floral sprays, are the work of the young Matteo da Milano – one of the leading illuminators of Milan – who received commissions from the most important Houses of Renaissance Italy. 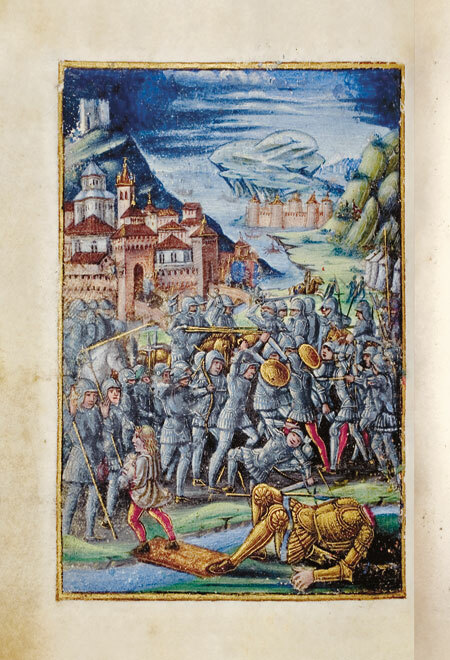 Patronage The codex was commissioned by the Milanese Della Torre or Torriani house, an illustrious family of Lombardy which, for some time, ruled over Milan. Further confirmation of the Milanese origin of the work is to be found in the inclusion of certain features such as local saints, in the Calendar, and the church of Santa Maria Maggiore, Milan’s old cathedral, surmounted by a statue of Saint Ambrose (the Patron Saint of Milan). 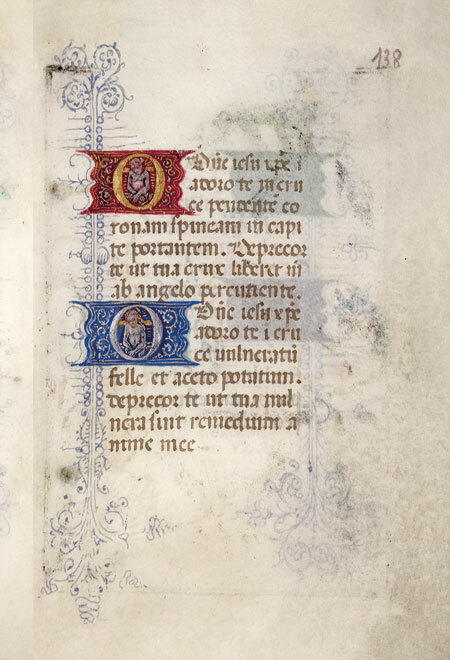 However, the identity of the lady for whom the codex was made, perhaps a lady of the court of Ludovico Sforza, is unknown. The work is accompanied by a book with commentary, edited by Pier Luigi Mulas, with writings by Marco Collareta, Jean-Baptiste Lebigue and Monica Visioli.